The Australian gold sector (XGD) is selling today (intra-day) at a record 53.56% below its 200dma. This is a rare event indeed as even the 2008 violent panic crash produced a low around 48% below the 200dma at that time. This current crash on the Australian XGD is a fall of 66% since October 2012 and a fall of 75% from the all-time high of 8498.9 in April 2011. To understand this index you have to look at its makeup. The index is weighted and therefore dominated by our largest gold stock Newcrest which has fared very badly this month. Therefore the Newcrest weighting in the index has lessened over the recent month. This stock has fallen 56.1% since the 27th March this year and 36.63% since the 4th of June alone. With Newcrest down so far you have to ask where the rest of the sector is relative to old lows right now. Nick Laird of Sharelynx provides excellent unweighted charts of gold sector segments in his site (amongst a multitude of other charts). He allows me to show a sample of gold sector 5 year charts on one page in GoldOz. Titled “Gold Charts” in the top tool bar the page is well worth a visit. The large producers have not been this cheap since 1990, because they have just dived below the 1998 lows. The same applies now to the emerging producers and the explorers index only deeper still. Suffice to say I am not a seller at these levels for there is more than blood running in the streets. Not only have small speculators exited the gold futures they have largely deserted the Australian gold sector as well. One must not try to make sense of an isolated sector alone however. There are always a great number of factors to consider including the Fx cross rates which are primarily related to international capital flows and the local economy. Capital flows are headed to the USA as global conditions now replicate what we were looking at in Asia during 1994 ahead of the Asian crisis of 1997. 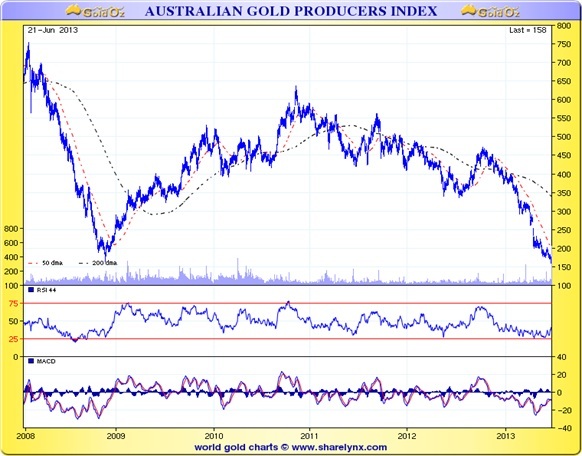 We have the local gold price to consider and investor confidence on equities here in Australia as well. The money is coming out of Australia and I had warned my offshore clients over a period of time about the local economy and the high AUD. Now the heat is out of the “Aussie” some off-shore capital may move back to snap up bargains in our gold sector. The AUD gold price is attractive compared to US gold as the AUD has also crashed. Naturally this has relieved cost pressures on the local producers. On the 16th April AUD gold made a low of $1281.3 whereas it has now failed to confirm the latest USD gold low. On the 7th June the AUD gold price had risen to a high of A$1494.1 and has since fallen to a low of A$1376.3 nearly A$100 higher than the previous low. This leaves the low cost domestic producers with a strong margin and yet the baby has been thrown out with the bath water. This is quite normal during a severe down turn we saw the same thing happen in 2008. The AUD may have much further to fall over the next year or two however the leverage on these gold stocks now represents a low risk entry point if you are looking to the secular horizon; out to the end of this gold rally in future years. This is now buying season for all to enjoy. I am expecting spectacular rises off the current levels. Of course we study the gold sector carefully here and have loaded up with the elite gold stocks in our Educational Portfolio. The reasons for these selections are provided for Members because we are about education. We have been strong buyers in the index over the past two weeks, mostly last week, after last selling around 50% of the Funds in September / October 2012. I have been searching for a clear bottom ever since and may have jumped the gun a little at this time. I started buying in earnest below the 2008 low however after waiting almost 9 months to get serious. Therefore the pain of the past two days is likely to be short lived. These are extreme markets now panicked by conditions in China, Japan and the EZ. Contrarian investors that buy these types of extreme conditions have to be able to stand the heat so this is not for the faint hearted. The fundamentals are still strong for gold however it is all about the timing. The first major support area was US$1250 and we have already seen US$1269.1. If this area fails we see a chance of US$1170, US$1030 and even the $900 area as an extreme low. Now the momentum is down on the AUD there is a chance this would continue in such an extreme move at this time. This would continue to provide a buffer for the leading local producers ensuring they will survive this market in good shape. GoldOz has now introduced a major point of difference to many services. We offer a Newsletter, data base and gold stock comparison tools plus special interest files on gold companies and investment topics. We have expertise in debt markets and gold equities which gives us a strong edge as independent analysts and market commentators. GoldOz also has free access area on the history of gold, links to Australian gold stocks and miners plus many other resources. Neil Charnock is not a registered investment advisor. He is an experienced private investor who, in addition to his essay publication offerings, has now assembled a highly experienced panel to assist in the presentation of various research information services. The opinions and statements made in the above publication are the result of extensive research and are believed to be accurate and from reliable sources. The contents are his current opinion only, further more conditions may cause these opinions to change without notice. The insights herein published are made solely for international and educational purposes. The contents in this publication are not to be construed as solicitation or recommendation to be used for formulation of investment decisions in any type of market whatsoever. WARNING share market investment or speculation is a high risk activity. Investors enter such activity at their own risk and must conduct their own due diligence to research and verify all aspects of any investment decision, if necessary seeking competent professional assistance.